If you are a resident of a community in the San Bernardino National Forest, you know that you and your family live under the constant threat of fire. The forest and brush that surrounds you has the potential during a large part of the year to become a raging inferno that can wipe out your home and all the businesses and structures in your community. Along with the thousands of people who visit the mountain communities on weekends and on vacation, you therefore have a major reason to prevent a wildfire from taking its toll. Wildfires happen. Lightning strikes, careless smokers, sparks from a machine and other natural and human factors can cause a fire. So, if we are being realistic, it’s not a case of whether a wildfire is going to start, it’s when. Residents of Idyllwild and Pine Cove know how close their homes came to being destroyed when the Bee Canyon fire came to the western edge of town in 1996 before winds at the last minute moved it away from the community and it was finally contained. What can we – the people who live here – do to prevent another fire from burning our homes to the ground? PLENTY! Knowledge of what needs to be done, backed up by assertive and consistent action, is the answer. The Mountain Communities Fire Safe Council, a nonprofit public benefit corporation, was formed by residents of the Hill communities in the summer of 2001. Funded by grants and donations, the Council is a grass roots organization that is run by people who care about protecting their lives and their stake in the community. They donate many hours of their time to developing and implementing a variety of programs to help make their communities fire safe. They do this in a variety of ways: · Educating community members on fire safe matters through public meetings and distribution of literature; · Assisting government agencies in carrying out programs to benefit the community; · Obtaining grants and implementing fuel reduction programs to create buffer zones which will help keep a wildfire from entering the community; due to the current economic conditions these grants are being severely restricted; finally, · Serving as good examples of why it is so important to take a keen interest in not only their own safety but also the safety of their neighbors. 1. Speaking with a united voice for the membership and the community, the Council – through its elected Board of Directors – can influence our governmental representatives to initiate and support important programs for fire safety. 2. As part of the California Fire Safe Council which has more than 125 members, the Council has access to a wide range of proven and effective fire safe programs and resources that can be used in our community. 3. One of the main goals of the Council is to create the best possible relationship between the community and the governmental fire agencies that serve this area. This ongoing two-way communication is a key component in ensuring the best possible results for meeting the needs of the community. 4. Through its Site Evaluation Program and other projects, the Council helps improve awareness, knowledge and understanding about the need for every resident to abate his property according to the laws of Riverside County. The more properties that are properly abated, the more fire safe we all are. 5. With the commitment of many dedicated volunteers (The Woodies and others), the Council is making a direct, tangible contribution to the welfare of the community by such projects as helping to abate properties of seniors, low income and handicapped residents. 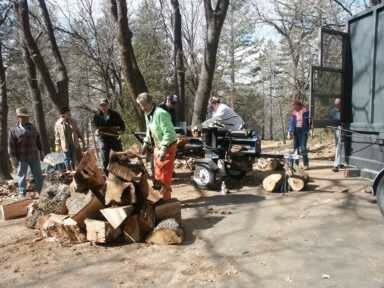 It also helps in cutting down dead trees, splitting logs and supplying firewood for needy families. 1. It’s an old saying but it’s true: there is strength in numbers. If you and others in your family, along with your neighbors, join the Council we are more able to carry out our programs and move closer to making the mountain communities fire safe. 2. Awareness of the issues and the challenges involved in making a community fire safe will help you understand why being fire safe is everyone’s business. Talk to a Council member. Attend the Council’s monthly board meetings. BECOME INFORMED! 3. Once you have a grasp of what’s involved, call, write, or e-mail our area’s elected representatives. Let them know how important it is for them to support the initiatives that are being taken by our local fire agencies to make, and keep, the mountain communities fire safe. For More Information Call our office at (951) 659-6208 or send an e-mail to: info@mcfsc.org . Click Here for a membership form in PDF format. Now you can donate through PayPal — just click on the Donate Button below. You do not need to have a PayPal account to donate using your credit card through PayPal or print a membership form below. Memberships are $20 and up so you can join at the level you find most comfortable.